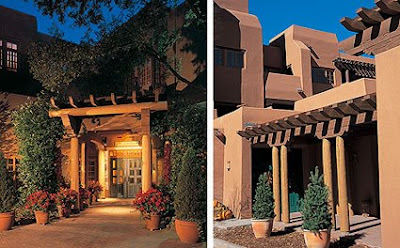 This 4-day workshop will be a combined classroom workshop with outdoor photographic shoots. 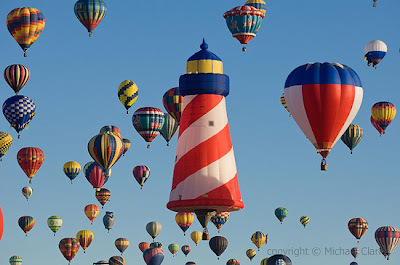 The workshop coincides with the Albuquerque International Balloon Fiesta, which is the world’s largest balloon festival and will certainly be one of our photographic destinations. All classroom instruction will be centered around Adobe Photoshop Lightroom v2.3, as well as the craft of creating a fine art digital print. To DNG or not to DNG? That is the question. Outdoor shoot up in the Aspens in the Sangre de Christo mountains above Santa Fe. Early October is a fantastic time to be amongst the aspens as they change color. Computers will not be provided but participants with laptops should bring them. Following along on your own laptop is a hands-on way of learning what is being taught in the classroom. Landscape shoot at Plaza Blanca, an area near Abiquiu, NM that was made famous by the painter Georgia O’Keefe. Hands-on printing with current large format printers on the market. Paper provided by Moab Paper and printers on loan from Santa Fe Camera Center. Participants leave with one fine art print of their own work! 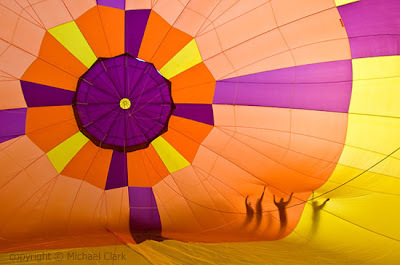 Michael Clark is an internationally published outdoor photographer specializing in adventure sports, travel and landscape photography. He produces intense, raw image of athletes pushing their sports to the limit and has risked life and limb on a variety of assignments to bring back stunning images of rock climbers, mountaineers, kayakers and mountain bikers in remote locations around the world. He contributes to National Geographic, National Geographic Adventure, Sports Illustrated, Outside, Men's Journal, Backpacker, Outdoor Photographer, Digital Photo Pro, Climbing, Alpinist, Rock and Ice, Bike Magazine and The New York Times among many others. Andy Biggs is an avid adventurer, conservationist, teacher, and outdoor photographer whose photography celebrates the African landscape and its rich wildlife, people, and culture. With a deep respect and understanding for African wildlife, Andy unfolds the world of the Serengeti onto our doorstep with striking emotional depth. His photographic safaris allow the traveler to not only enhance their understanding of photography, lighting, and wildlife, but to develop a life-long admiration for Africa 's beauty and culture. You can check out Andy's work at www.andybiggs.com. The cost of this workshop is $995 per person (inclusive of light breakfasts either in our teaching space or in the field). The same rate applies for each participant regardless of whether they are doing photography and participating in the workshop, or not. A nonrefundable deposit of $300 is required to secure your spot on the workshop. Final balance will be due no later than September 1, 2009. • a laptop computer with a DVD burner or an external hard drive – PC or Mac is acceptable. Instructors will be using Mac. If this workshop has your name on it, then now is the time to register. Remember, there will be limited space available for this workshop. When they're spoken for, that's it. To register follow this link to Andy Biggs website where you can register and pay via PayPal. If you have any questions before registering, send us an e-mail with any inquiries to info@andybiggs.com. 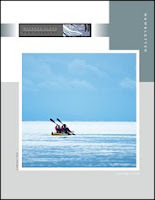 The Spring 2009 issue of the Michael Clark Photography newsletter is now available for download. If you'd like to sign up for the Newsletter just drop me an email and I'll add you to the mailing list. This issue includes an editorial on my adventures over the last five months, a review of Nikon's D700, an article about my adventures covering the 2009 Wenger Patagonian Expedition Race and a special Portfolio showing images shot on assignment for Men's Fitness and much more. Lowepro gave me one of their prototypes to take with me to Patagonia a few months ago. My mission was to put it through the wringer and see how it fared in some very inhospitable weather. That was accomplished quite easily since it rained everyday. In particular I was working with their new Toploader Pro 75 AW, using it both as a chest pouch while carrying a backpack and also in fanny pack mode with one of the deluxe Street and Field series waist belts and a few lens pouches. 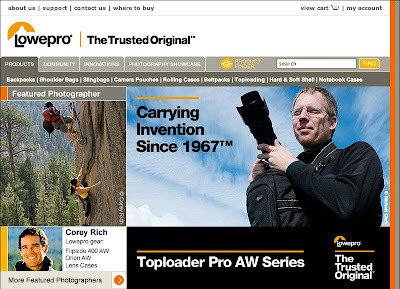 Lowepro redesigned their website recently and a rotating image of me (see above) using the pack comes up when you visit the site. I just signed on with Lowepro last fall but have already had some great conversations with them on how they can improve their gear. In the course of those conversations I was amazed to hear just how thoroughly they have thought through all of the issues we deal with out in the real world as pro adventure photographers. Over the course of my career, I have accumulated a dozen or so of the Lowepro bags. I seem to have a camera bag fetish, since certain bags seem to work very well for shooting certain sports. Among my favorites are the Vertex 300 AW, Specialist 85 AW and the new Toploader Pro AW. If you read my earlier blog post about falling into the ocean with the Toploader Pro 75 AW and my Nikon D700 and 28-70mm lens then you know part of the story. The Toploader Pro wasn't designed as a waterproof bag so I wasn't surprised by the demise of my camera because of the accident, but in every other way the Toploader Pro is far superior to the Topload Zoom packs it replaces, especially in rainy, wet conditions. My good friend, Tony Hoare, shot the photo that appears on the front page of the Lowepro website, shot while on the go in Patagonia. 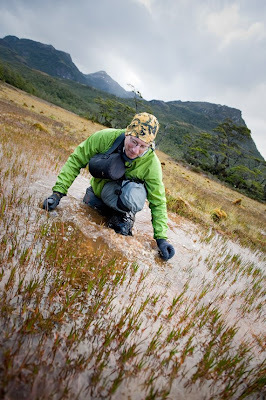 The image above of me in a deep peat bog was shot by Mark Watson, an incredible adventure photographer from Australia who was also covering the 2009 Wenger Patagonian Expedition Race.